For a few years now, I have recognized the need to write about the “clock room.” I first documented its truths and scriptural ties in the three months prior to September 11, 2001. But I was unhappy with and frankly a little embarrassed by the amateurish and unorganized attempt to write in that summer of 2001, wanting instead to start over and retell the story from the beginning. Each time I tried, however, writer’s block ensued, leaving me helpless in its wake. Rather than attempting to start over, which was not working, I decided to keep what was written then, explain and clarify it and move forward from there. It is important to understand that September 11, 2001, is not the topic of this story. Yes, it is a part of it, and peace be upon those who were murdered and terrorized on the four airplanes, at the World Trade Center and at the Pentagon. The events of that day are tied to this story that began in 1997 and continues to this day. It is a story that parallels the attacks but is in no way involved with them. It is not another “conspiracy theory.” Those are usually offered in hindsight. Foresight better applies to the timeline here. This story is completely separate in content from, but fully grounded in the context of the attacks on the U.S. Considerable, real evidence, including science, will be presented to show September 11, 2001, was a force-of-nature event associated with the Bible’s Book of Revelation. A few years before the attacks, what I call “tangible” truths were slowly coming together. 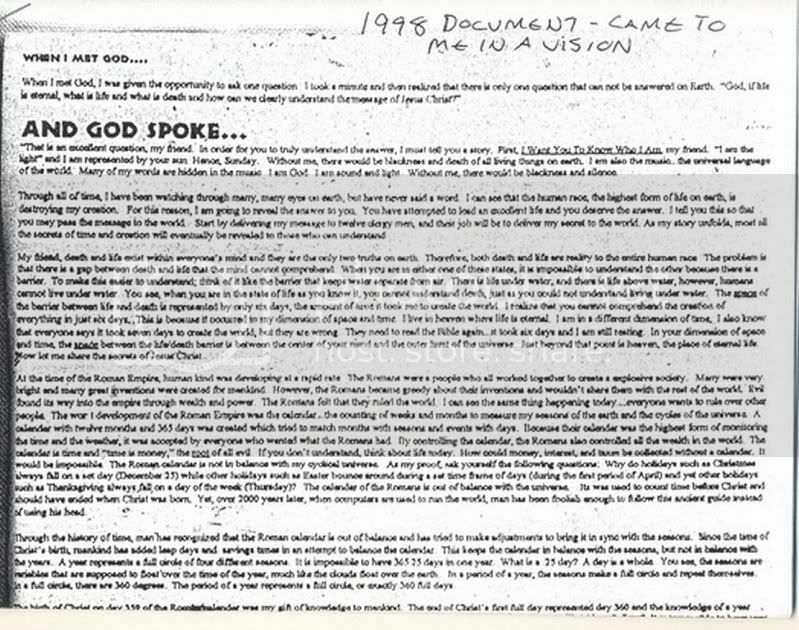 A 1998 document, which came to me through a supernatural vision, was the first of these truths and also the first tangible item of this story. I believe the document, a copy of which is included in this introduction, was a message from God. Its ties to September 11, 2001 are explained in this story. 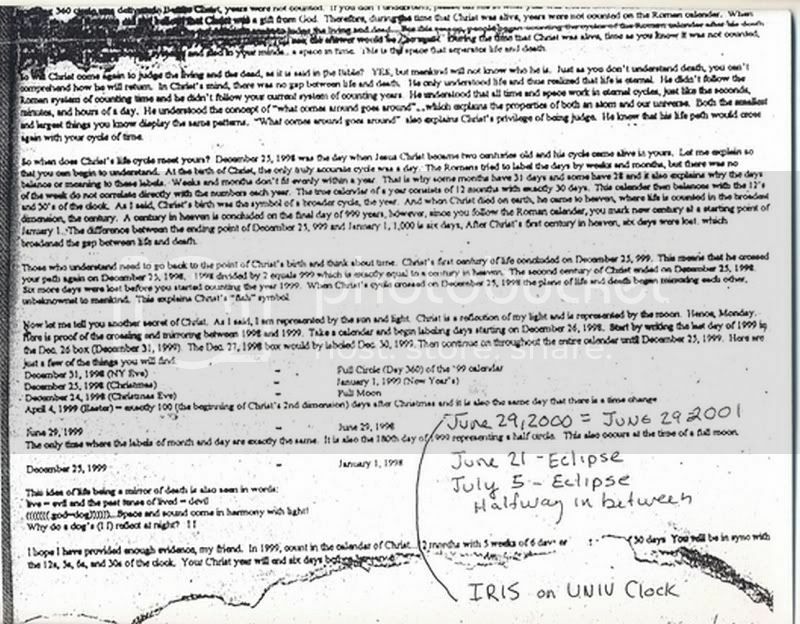 A scientific astronomical chart and an astrological clock became part of the story in 1999. Their ties to the 1998 document, the Book of Revelation and September 11, 2001, will also be explained in this story. From September through December, 1999, these tangible truths were coalescing in a remarkable way. I began calling this convergence the clock room and was convinced of its immense importance. I abandoned my job, emptied my bank account and bid farewell to my girlfriend in this pursuit. The moral and financial support I hoped would soon follow never did. In January, 2000, it became necessary to pack the clock room away in a trunk, where it remained for the next eighteen months. A few months prior to September 11, 2001, the trunk was unpacked, and its contents began coming together again, this time, rapidly. During this time of re-discovery, I started writing about it in a journal. Those entries, dated and organized into chapters, were sent to a variety of friends and family members. Three chapters were written, although chapter three was halted, half-finished, on August 9, 2001. I titled the writing “In My Head,” which was a bit of sarcasm aimed at those wanting to attribute these things to bipolar disorder. According the experts in the field, bipolar disorder is traceable to a chemical imbalance in the brain. The topics here, however, are related to tangible things that can be touched, seen, examined, explained and even videotaped. In addition to the writing, amateur video documentation began in August, 2001. This book will be a continuation of the writing. A fifteen-year “pause” exists from the time chapter three was suspended till this resumption of the book. As these truths came together rapidly in the summer of 2001, there was no time to document them properly. The 1998 document’s ties to the scientific charts, which now had meaningful verification, first required a proper overview of both the document and the charts. I was instead scrambling to explain both the present and past while simultaneously consumed with discovering remarkable things. Those constraints notwithstanding, the first three chapters still managed to include mention of everything demonstrating that the attacks were a force-of-nature event tied to the Book of Revelation. For that reason alone, this prior written record was extremely valuable. I began to comprehend its meaning when I saw the attacks on television that horrific morning. Where were you? And where was I? Although chapter three was suspended, the ongoing documentation was not. Two days later, on August 11, I delivered the chapters written to date, the 1998 document and amateur video showing the clock room to my local NBC television affiliate. These were returned a week later, no questions asked. Around that time, a series of written, encoded memos began spewing through me, and on August 28, the first earthquake of a swarm that would become twelve, shook in my region. Amateur video captures my path going forward for years beyond September 11. The encoded writings also continued their frequency sometimes incredible. The 1998 document and scientific charts would reveal further, remarkable discoveries. In subsequent chapters, these will be presented. Stories are best understood and comprehended when told beginning to end. The way to do so, while keeping the previous record—in this case, the three chapters—intact, is to extract content from that record and present it in order. As this is done, the story will be further explained. In attempting this, I feel, an enormous responsibility to strive for truth, a word, as you will notice, used often in this introduction. As the presenter, I welcome a polygraph and Bible oath to verify what I write. Beyond those methods, there are eye witnesses to this story from beginning to end. And finally, the importance of videotape becomes invaluable, beginning in August, 2001. This story does not need deception to support it. In fact, any discovery of deception would only do harm to me and to the claims being made. As I begin to (re)write in August, 2016, the story goes on. It has been fifteen years, or one-hundred and eighty months. I have reason to believe the next chapter is right on schedule. The story will not end until every truth, tangible and tie to scripture is fairly and thoroughly reviewed, studied, understood and, finally, valued. Only one person is familiar with each and every one of these, and only one person has estimated a value for each and every one: me. Others, such as the news media, were offered the opportunity to know and value them on many prior occasions, but passed. Copyright © 2012, Gregory The Truth. All rights reserved.